An example of the analytics graph from the plugin. This plugin performs training analytics, such as Running Efficiency, Training Monotony and models that predict performance, as well as publishing workouts from SportTracks to Dailymile and Runkeeper. Double click the .st3plugin file to install. You will then see the graph of workout information. To get more help, hover your mouse over the controls. 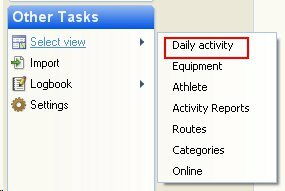 You must have a Dailymile.com and/or RunKeeper.com account setup. Start SportTracks if it's not already running. 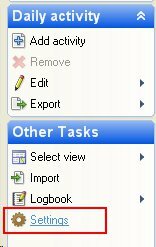 Click on an activity to select it for export. Multiple activities can be selected, but this may take a long time and Dailymile.com limits the rate of uploads, so you may experience errors. The first time you use the plugin, a popup will ask you to log into Dailymile and/or RunKeeper and authorize the plugin. Logging on with your Facebook account causes problems - please log on directly. The authorization token is stored in the logbook, so different SportTracks users can have different accounts. You can clear the authorization information by looking under the plugin specific settings. You will see a popup allowing you to customize the data exported. Note that you can get help by hovering your mouse over a field, as shown below. This dialog allows you to select specific laps for publication. This is useful if you are doing interval training and only want to publish the work intervals. To select laps, click on a lap. Holding the control key will add to the selection, holding the shift key will select ranges. 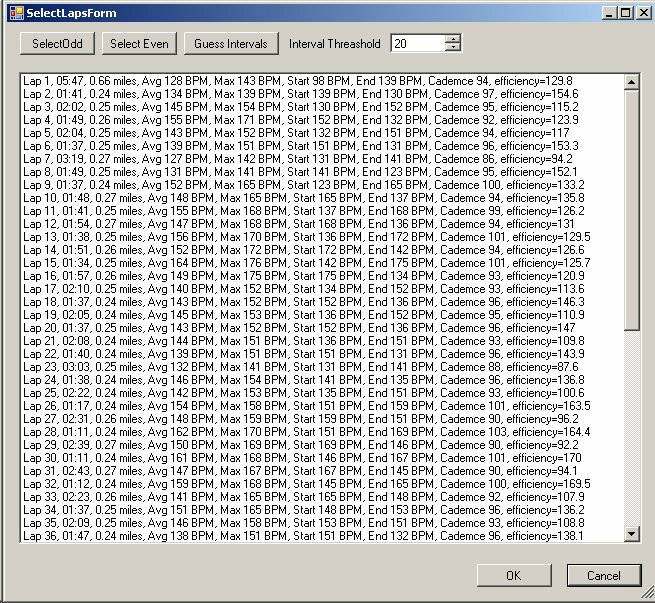 Pressing "Select Odd" will select the odd numbered intervals. The selection can then be modified by clicking on laps with the control key pressed. Pressing "Select Even" will select the even numbered intervals. The selection can then be modified by clicking on laps with the control key pressed. Pressing "Guess Intervals" will look at the start and end Heart Rate to determine the work intervals. The 'interval threshold' is used to determine the work intervals. A lap will be selected if the finish Heart Rate is greater than the start Heart Rate by at least the threshold value. select the even numbered intervals. The selection can then be modified by clicking on laps with the control key pressed. There is support for other languages; click on 'show category translations' at the bottom of the settings page. When these are added to the API, I will add support in the plugin. If you change your account on Dailymile.com, or RunKeeper.com you'll need to clear the token that this plugin stores. Select "Fellrnr Settings" and click on "Clear OAuth Token" for the site you want to change. You'll be prompted to log on next time you publish. There are a few problems with accessing Dailymile.com using Facebook credentials, and it is better to log in with an email address and password. For support, email plugin <at> fellrnr <dot> com. Fix graphing of TRIMP when there are multiple workouts per day. Split posted message into shorter lines to prevent '500 server error'. Fix a bug that was causing a crash if the plugin was installed from scratch rather than upgraded. Fix some authentication issues with Dailymile.com. Performance improvements posting to Dailymile.com. Add more options to the advanced dialog. Add ability to post the GPS data to Dailymile.com. Add a button to the advanced dialog to save the checked options as a future default. Change menu so that you select 'felt' as part of the export. Give the option to post workout using the current time rather than the start time of the workout. This is only available for workouts completed today. Correct a bug that stops manually entered workouts from having a distance. Use the smoothed Heart Rate and Cadence data rather than raw values. Default to all laps selected on the select laps dialog. This page was last modified on 19 March 2015, at 05:52.